This is the fourth post in a sequence of 5. The first post introduced features of all timelines, the second is focused on the specific aspects of the Video Demo Timeline, the third on the aspects of the normal/responsive projects (cptx) both for master slides and normal slides. To understand this article - perhaps the most important - I recommend to read at least the first and the third article as a preparation. This topic is more suited for a live event: a real or a virtual training session. I expect a lot of questions, and those are easier to answer in a live event. I have presented several webinars for Adobe in the past (most about advanced and shared actions), but that practice seems to be discontinued since a while. If you want to participate in a meeting (Connect room), I'm prepared to organize it. Send me a note: either by mail (info@lilybiri.com), in the comments on this post, or use Twitter (my handle is @Lilybiri). In case of sufficient requests, I'll propose a date/hour (probably am PT, for users in USA) and will need an e-mail address for the invitations. As a bonus, will offer you some files. Pausing the timeline means stopping the Playhead. However that can be done in in two ways, and they do not affect the items in the same way. Let me first explain what I mean by 'Pause' as opposed to 'Pausing Point'. 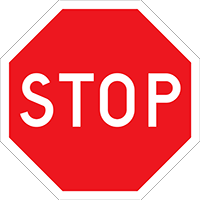 You'll see that I compare them with two traffic signs: Pause with the red light, Pausing point with the Stop sign. But also in traffic, some 'items' do not respect those signs, legally or illegally. With the pause button on one of the default playbars. By choosing the command 'Pause' to be triggered On Enter for a slide (doing it On Exit is not a good idea, because it will happen after the last frame, see previous post about events). It can also be a (last) command in an advanced/shared action. By using the Success event an interactive object (like a shape button) with the command 'Pause' either as a simple command or within an advanced/shared actions. Usually it will be the last command. Alternative for 'Pause' command is to assign 1 to the system variable cpCmndPause (its default value is 0). This system variable controls the pause. If you use a playbar, you'll see that the progress bar is stuck when Pause is encountered. To understand even better, I recommend to insert the system variable cpInfoCurrentFrame in a text container, displayed for the whole project (on top). You can use the Play button on the playbar, or need the command Continue, which is available as simple action and in the dropdown list in advanced actions. Score slide: same situation as for the quiz slides: visible in the slide timeline, not in the Timing Properties. Default timing is at 1,5secs. Pausing point is linked with the Continue button, but will not show in the Timing Properties panel of that button. Waiting here is for the user to click the Continue button. Drag&Drop slide: is pausing at 1,5secs but the point is not visible on the timeline. You will not see it in the Timing Properties for the slide, but in the Actions tab of the D&D panel. It is linked with the Submit button, when selecting that button the Timing properties panel will show the timing of the pausing point. Waiting for the user to click the Submit button, or in case of Auto Submit waiting for a correct answer. Interactive objects (click box, button, shape button, Text Entry Box) can have a pausing point, to be defined in the Timing Properties panel. That pausing point will be visible in the Timeline, and the part before the point is indicated as 'Active', part after the pausing point as 'Inactive'. Since a click box is invisible to the user, it has not inactive part, its pausing point will always be at the end of its timeline. Waiting is for the user to click either on or outside of the interactive object (click box, shape or normal button) or to confirm the Entry in a TEB. You can edit the pausing point by dragging in the Timeline or in a precise way by editing the Timing Properties panel. It is also possible to uncheck the Pause (see screenshot 3 in the Gallery). Bonus: You can download a (watermarked) pdf with this overview from PausingPoints. For Question slides: the playhead is released after the second step of the Submit process and the actions defined in Question properties will be done. For Score slide: similar, but after clicking the Continue button. For Drag&Drop: exactly the same as for the Question slides, after clicking the Submit button. For interactive objects on master or normal slides: if an advanced action is executed (Success/failure) the playhead is not released automatically. If you want this to happen you have to include a Continue or a navigation command like Jump to as last command in the action. If you use a simple action, the playhead will be released by default, but in CP9 it is possible to uncheck that default setting 'Continue playing the Project' (not done in this screenshot). Not everything is paused by the absolute Pause command, nor the Pausing points. Watch the interactive movie to understand better. Some items are never paused, some are paused by both Pausing points and the Pause command, some are only paused by the Pause command, not by the pausing points although there may be a workaround. The position of the playhead when pausing is important: objects for which the object timeline starts later than the pause will not appear until the playhead is released. Same is the case for Effects which have a duration, a timeline: if the pause occurs while the effect is not finished, it will stall in the last position and continue only when the playhead is released. Animations however are never paused, not even when you use the Pause command triggered by the On Enter event of a slide. They will always play. Background audio is totally insensitive to Pauses or Pausing points: it will continue to play. 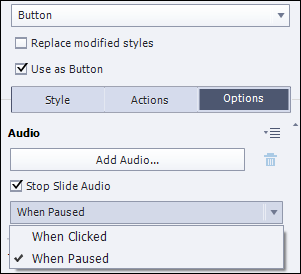 Slide Audio: will automatically be paused by the Pause command, but not by a pausing point. It is possible to pause slide audio at a pausing point, to resume when the playhead is released if you check 'Stop Slide Audio' on the Options tab in the Properties panel of the interactive object. For the default pausing points on quiz slides, score slide, D&D slides you cannot pause the slide audio however. This seems confusing, and can lead to a problem. Slide audio clips automatically will increase the duration of the slide. You learned that the default pausing point of this type of slides is always set to 1,5seconds. If the playhead is released with the command 'Continue', it will have to visit all the remaining frames on the slide, those frames in the 'big' inactive part of the slide. To avoid that, I recommend that you change the default pausing time and make it just a little bit smaller than the slide duration. This is not necessary if the actions when releasing the playhead from its pausing point are a navigation to another slide, because the inactive part of the slide will just be skipped. 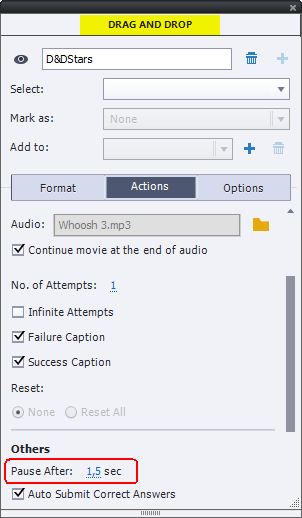 Object audio: will be paused by the strict command Pause, but not by a pausing point! There is no workaround for this behavior for a Pausing point. Audio started with 'Play Audio' cannot be stopped not by Pause nor by a pausing point, the only way to stop it is by launching the command 'Stop Triggered Audio'. Instead of creating very long slides to fit the narrations, use the Play Audio command and have a pausing point on the slide. That can be a Next button, which offers total control to the user. Question slides with narration as slide audio: you need to move the pausing point. Create custom navigation: use shape buttons on the main master slide, only one of them needs a pausing point to give each user all the time needed to watch the slides. Create a slide with light boxes. Have multiple TEB's on one slide with a unique Submit button. Create a dashboard with buttons to display multiple vodcasts, images, podcasts.